It’s been two years since we visited Vrindavan to photograph the illustrious Holi celebrations. 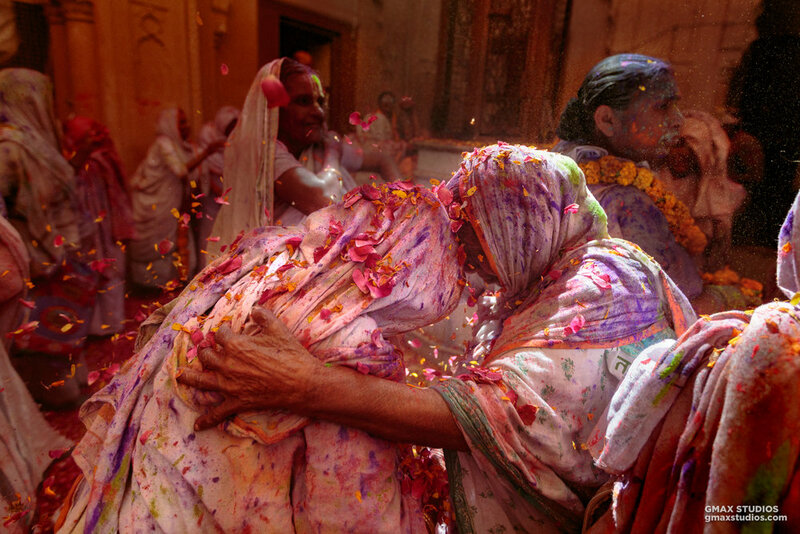 While the trip was special to begin with, the famous widows of Vrindavan played Holi with color for the first time in 400 years - making the occasion extraordinary. It would've been ideal if we published this article in 2016 itself, but photographs are even better to look at when there’s a little history attached to them. That being said, none of these photographs were easy to take. It was the first time our camera and gear was exposed to water. We’ve since done a live session and a video tutorial on how to protect your gear from water, but nothing could have prepared us for this. Once we made it to the dharamshala that we would be staying at(more like leaving our luggage there because we’d be shooting continuously), we headed to Gopinath Temple. There are streets in India that even google maps can't figure out, and a lot of the shortcuts and alleys in Vrindavan are like that. The people in Vrindavan were extremely kind and courteous, and pointed us in the direction we needed to go. At times they would even get on to the rickshaw and tell the driver exactly where to turn! Once we were on the right path, they would get down and start walking back. Something like this is unheard of in Mumbai. To the people of Mathura, it’s just life. Chill unparalleled: Folks kickback and play a game of chausar. On the way to Gopinath Temple, we witnessed absolute chaos. People were celebrating without a care in the world, sparing none and soaking just about anybody who happened to cross paths with them. We had a faint idea that something like this could happen, and so we wrapped our lenses in cling foil and also practiced changing lenses with the cling foil a few days in advance. This helped keep the water, color and dust out, and allowed us to get some decent photos of people celebrating in the streets. Holi celebrations were in full flow in Nandgaon. The scene at Gopinath Temple was nothing short of a riot. In the corridor, hymns and songs of celebration were being sung to the rhythm of mrdangas and kartals. The white saris of the widows were laden with color. Local priests and scholars, who in the past had kept up the practice of not interacting with the widows joined in on the fun. There was so much going on that the photographic possibilities were endless and making decisions was difficult. It was like a scene from a film. The clothing, their refined choreography and their unique personalities was something we’d never come across. It seemed like a place free from the hassles of daily lives, where things like fear and anxiety don’t exist. That day, we learned a new way to live life. And that the widows have an endless supply of energy! The celebrations carried on from 10 in the morning to 3 in the afternoon. “We’re happy that we can finally play Holi like everybody else, but even if it didn’t happen, we are still deeply moved by Krishna in our hearts” said an old widow to us, when we asked her if she’s excited about celebrating Holi with color. The widows don’t partake in the consumption of bhang or any other intoxicants. But clearly, the lady in the picture was having the time of her life. As a photographer, if you’re determined enough, the opportunities present themselves. The tarpaulin roof in the temple corridor had a hole in it, and a trail of light shone through - making the moment even more magical. We had gone up an empty staircase to change lenses when we saw the lady in the picture surrounded by flower petals. Moments later, another widow came by and unloaded a bucket of green color on her. We asked the lady in the photograph if she would let us take a picture of her. She didn’t respond with a yes or no but simply stood still. The photograph is an indicator of the love Vrindavan widows have for humanity and what humanity has put them through.The striped pattern on the wall resembles a prison both literal and psychological, that the widows have inhabited for centuries. After a few refreshments and a sip or two of Holi’s most cherished drink - bhang, we headed to Banke Bihari Ji Temple. The temple houses Lord Krishna’s supreme avatar. Every year millions flock to see Krishna in His tri-bent, playful pose during Holi. He’s hidden behind a screen that is lifted only for five seconds during the festival. One needs to have steely determination to photograph in a crowd like this because there wasn’t any room to even stand. The longest time we spent in one position was 3 seconds. And then the crowd would blow us away with the combined weight of at least fifty elephants. There was another big task to overcome. The task of not getting other photographers in the frame because there were tons of photographers from various publications and agencies documenting the event. But the most challenging shot was photographing the Holika Dehan. The event would take place at 5 am in Phalen, approximately 50 kilometers away from Vrindavan, so we needed to head to the location early to prepare. We arrived at 4 the previous evening. The Holi that burns in the city is a decent sized flame, but pales in comparison to what goes on in Vrindavan. It’s much longer, and consists of fast-burning bushes and twigs. Also, temperatures soar in comparison to the spontaneous assortment of logs that one can find in the city. What piqued our interest even more is the fact that a priest by the name of Babulal runs barefoot across the entire length of the fire. The practice has been passed down generations in his family. But one does not simply take a picture of a fire. We grabbed a 70-200 zoom lens and sat atop a two floor building across from where action would take place. We carried refreshments, and began considering all possible angles to take the photograph from where we were standing. After that, it was a game of patience. One of us managed to speak to the priest beforehand, who told us about the entire process. He would wait for his sister to pour some water over the fire to appease the gods, and once she had done that, he’d come sprinting towards the fire. It felt like we had prepared enough and would get the photograph easily. But we were pretty, pretty wrong. It was around one in the morning when the people started gathering around the pit. Some people had begun to climb up the building we were on. Their arrival wasn’t favourable by any means. As the night grew, they started to lose patience, because they wanted to get as close as possible on the ledge where we were seated to view the action more clearly. So the rest of our time was spent waiting for the priest's run to start and hanging on for dear life. The crowd was going so berserk that police officials had to use lathis to keep the public at bay. At 5 am sharp, the priest’s sister poured the water over the fire. Without a second's delay, the priest came running in. There was barely any time to frame the shot. We followed him to the end of the flame and pressed the shutter button. We boarded a cab at dawn, contended with ourselves and the things we had photographed. The experience in Vrindavan brought us closer to photography, and people in general. It all came with us - the kindness we’d received, the people we’d met - and the faces that we’d seen. 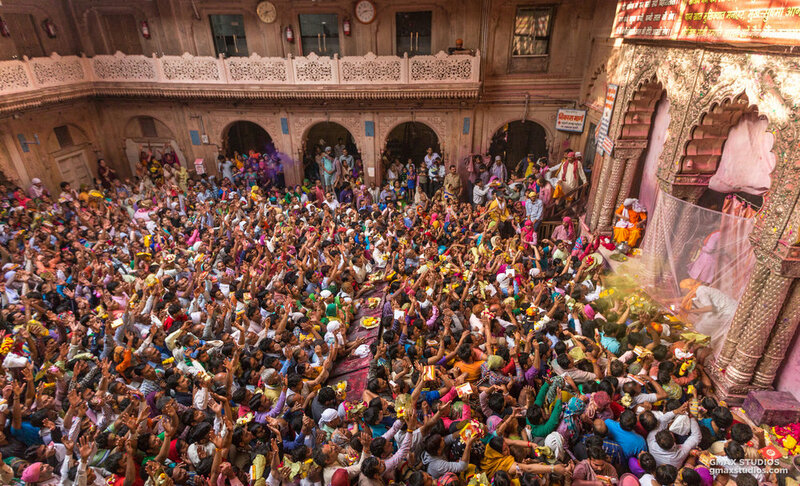 As Holi nears, we can't help but get nostalgic over the experience we had in Vrindavan. It was certainly difficult to say goodbye to.